Sri Vidya Mandir Sr. Sec. 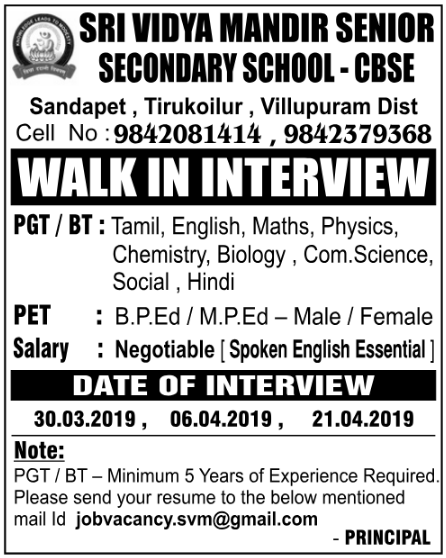 School, Villupuram has advertised in the DINAMALAR newspaper for recruitment of Teachers PGT / BT / PET jobs vacancies. Interested and eligible job aspirants are requested to apply and walk-in on 30th March 2019, 06th April 2019 and 21st April 2019. Check out further more details below. About School: Mind and body are inter related. In order to ensure healthy mind we give stress to the building of a sound body. So with this in mind we provide physical activities and games to each and every student both he and she . We have separate play areas and courts for all major games. We are proud to say that we have ear marked 5 acres for the department of sports. We have adequate staff including a Lady P.E.T. we participate in all major district level and state level competition and win cups and shields every year. How to Apply: Interested and eligible candidates are requested to send CV along with copies of certificates and recent PP size photo to the email address provided below and the attend the Walk-in interview on said dates.